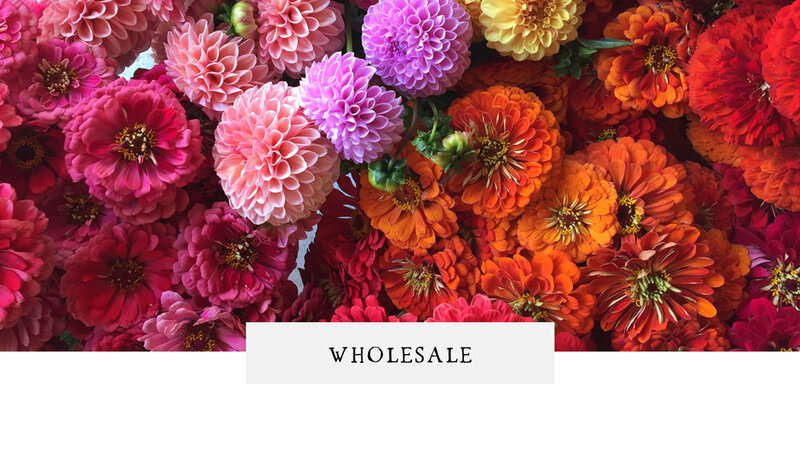 LOCALLY GROWN FLOWERS AND FOLIAGE FOR FLORISTS AND DESIGNERS. Our flowers are harvested by hand every morning and delivered fresh to you within a few days of being cut. By cutting into fresh clean water and delivering them to you this way, they should last a week or more in the vase. They are free from pesticides and other chemicals and can therefore retain their freshness and fragrance. We offer a vast variety of flowers that are rare, lovely, and changing with the seasons from early summer into fall. $150 Minimum required for delivery. Standing Orders Available on Florist Mixed Buckets. Weekly Availability List sent via email for easy ordering! These buckets are 5 –Gallon and will be filled with a selection of flowers/foliage/filler of mixed varieties. What goes into the buckets is not pre-determined but the best of what is available in the field on the day of harvest. *All other cuts are sold as 10 stem or Growers Bunches.